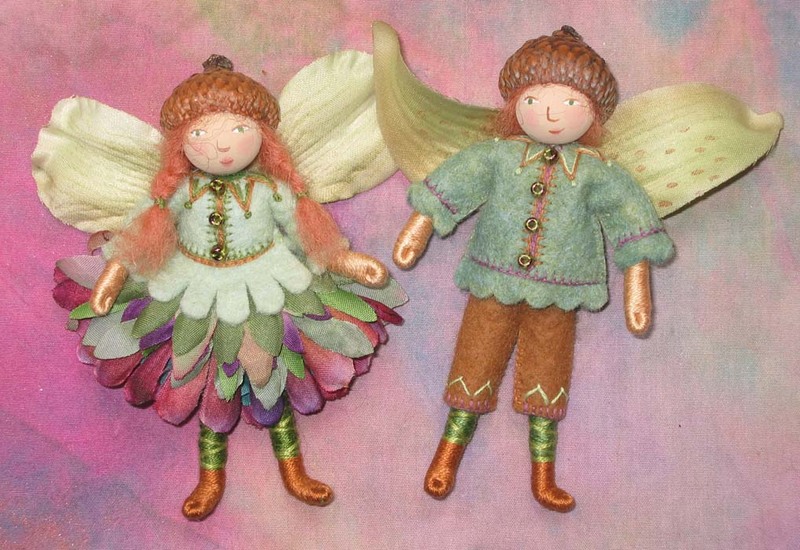 After a long hiatus, some new Fairies have arrived in my studio! I’ve enjoyed making this group of dolls after a break of a few years while I finished the illustrations for my new children’s book, Pocketful of Posies: A Treasury of Nursery Rhymes, which will be published in Sept. 2010. I’ll be showing more about the book in the future, but for now see Mimi Kirchner’s blog for a sneak peek. 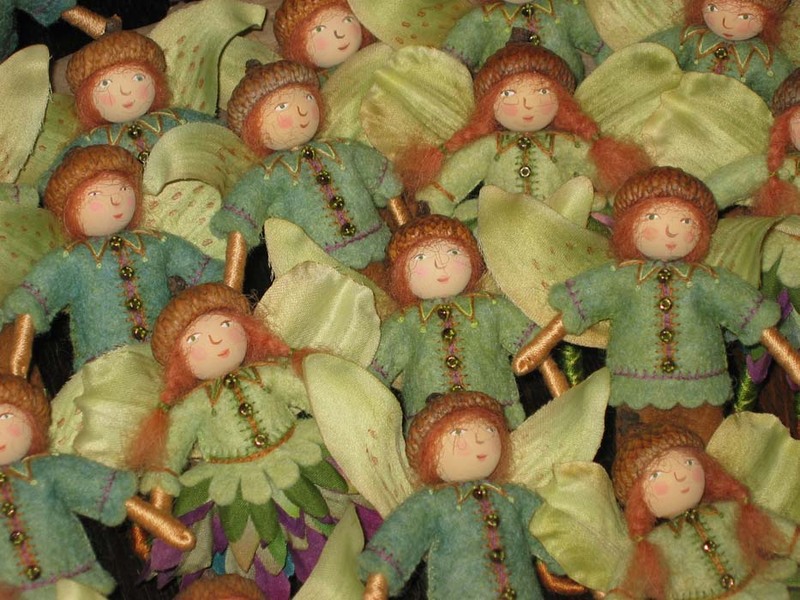 Here are some photos of fairy making in progress. 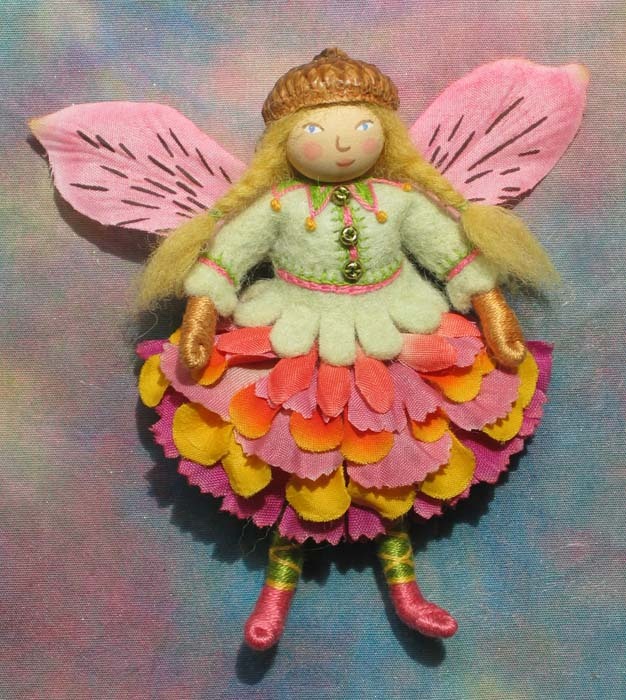 This entry was posted in Dolls, Fairies, Ltd. 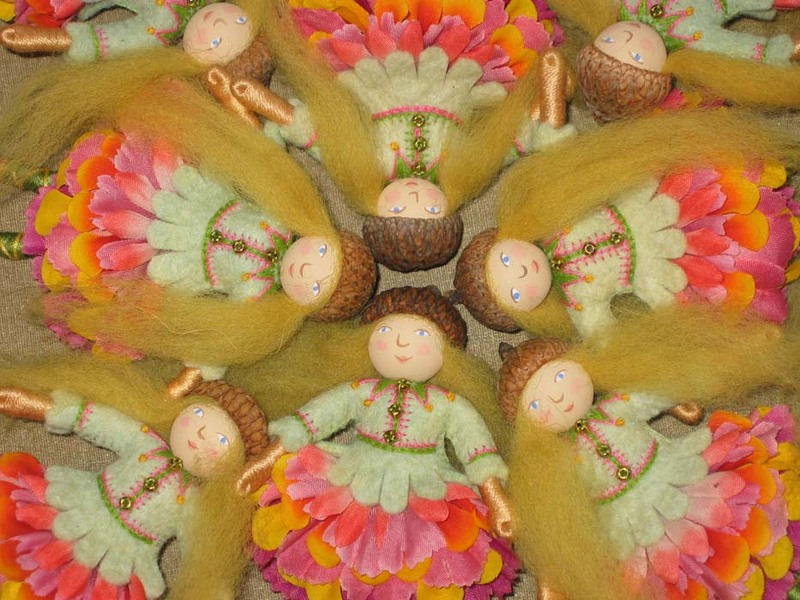 Edition Wee Folk Dolls, my design productions, Wee Folk by Salley Mavor. Bookmark the permalink. I am thrilled, truly thrilled, to see you join the blogging world. I have only recently aquired your book Felt Wee Folk. I have gotten as many of your illustrated books that our library system has. I love them all. I keep checking them out to look at all the details again. I have been inspired to try my hand at wee folk. To prepare I am re-learning how to embroider. I am having a blast and thank you for all you have shared. I have this blog bookmarked and will be a regular visitor! I never thought you were the blogging type. Love the blog! See you around the hood. Salley, thanks for taking the plunge into blogging. Your exquisite work merits a wider audience. Such a pleasure to see what you’re up to between books! Thanks for taking the time from your real work to share it through this medium. So excited to see you blogging. Figures you are friends with Mimi Kirchner. Can’t wait for the new book in Sept. Yes Lynn, I remember you and your shop. So glad that you came to visit! Beautiful work. You are so talented. Quirkey, fun, clever! I have spent over two hours looking at the beautiful needlework That makes up the illustrations which I hope to share with my 1 1/2 y.o. great niece. I sponser a little girl in Ghana through World Vision. She is 8 and has a younger sister. I have been wanting to send her a doll to play with or even better a doll family, but am limited to a 6″x9″ envelope. She lives in Northern Ghana in a house that is built out of mud and has either a thatched or sheet metal roof. After reading your books I am inspired to combine making a family of dolls from your book and making a combination felt embroidery/pop-up techniques to make a 3 fold scene with a house that will fold out so the door can be opened and the whole thing could carry the dolls. The little girl I sponser has her head shaved very close as is the custom in her part of the country. Any suggestions on how to represent that on a wooden bead? If I just paint it there will be a hole in the top of her head. 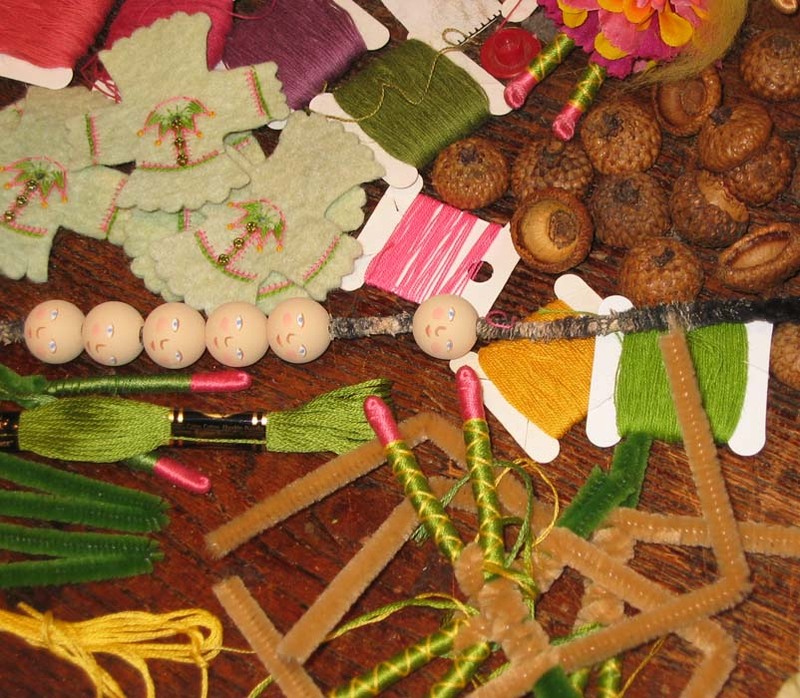 I was thinking french knots but do not know how to make that work on a wooden bead (men wear hats so an acorn cap can work for Dad) I have never seen a picture of her mother but her tribe is muslim so I think a piece of thin silk wraped around the head may work for Mom. I can use the instructions for making a dog and pictures I have to make the goats she received from World Vision. Maybe a second folder with a fold out fence and a garden embroidered in the background would make a great play set for Miriaim, her sister and her friends. Your books are very helpful but any suggestions that would help make some dolls that are culturally sensitive would be a great help. By the way I love your overstuffed chairs!